Now available in Paperback and as an e-book! It is also available as an e-book on most e-book stores. Here are two: and ways to get it. Margaret Buffie tells parallel stories of two girls who are kindred spirits in situation, if not in time or culture. In present-day Manitoba, teenage Cass is grieving for her mother. Her father’s new wife is distant, comes with a bratty new stepsister in tow, and spouts clichés with every breath. 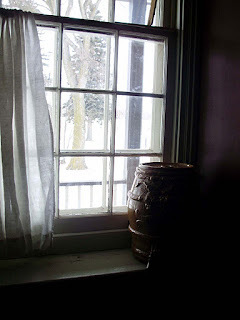 Meanwhile, in 1856, the same stone house is home to Beatrice, just returned from teaching in Upper Canada to another beloved father, and another stepmother who neglects Beatrice and her Cree grandmother. Expected to marry, Beatrice soon faces a choice between two very different men. Connected by Beatrice’s diary, the two young women become ghosts to one another. Cass wonders if her “shadows” are signs of clinical depression and insanity, while Beatrice, raised in the Metis culture with a strong belief in the powers of dreaming, accepts Cass as a spirit girl. Over the coming Christmastime, the worlds converge in decision and ultimate harmony. Lyrically told, with compelling characters, Winter Shadows illuminates the stigma of mixed ancestry in 1856, as well as the stigma of depression today. Great storytelling. Book News! 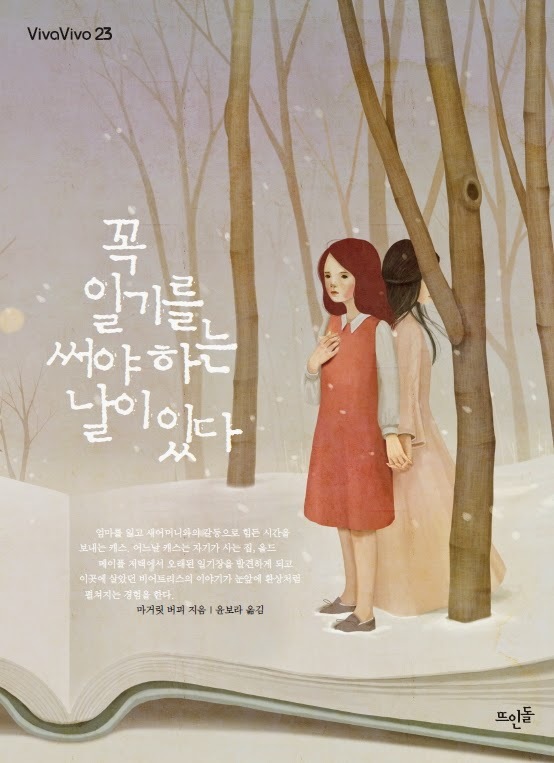 I am happy to announce Winter Shadows is now sold in Korea by Danielstone Publishing (World Korean). Here is a copy of the lovely cover they produced. Nominated: WINTER SHADOWS was nominated for the 2013 Young Reader’s Choice Award, sponsored by the Pacific Northwest Library Association made up of libraries from Alberta, British Columbia, Idaho, Montana, Washington. Winner: The Silver Nautilus Award, 2011: "Silver awards are given to print and audio books of exceptional merit that make a literary and heartfelt contribution to spiritual growth, conscious living, high-level wellness, green values, responsible leadership and positive social change, as well as to the worlds of art, creativity and inspiration. Winning books are featured at Book Expo America 2011." Finalist: The Canadian Library Association's Book of the Year Award. 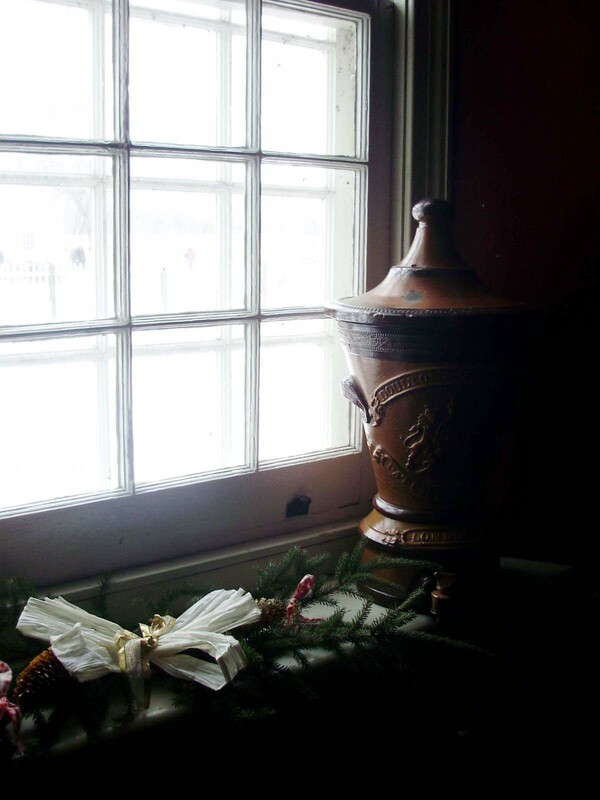 This is a story that takes place right around Christmas, both in modern times and in 1855. It is a ghost story ... or is it? In 1856, Beatrice has just returned from school in Upper Canada to find her injured father has married the jealous and spiteful widow Ivy Comper. Ivy’s son, who has come from Scotland to visit his mother, seems to be a large uncouth young man whose one pleasure seems to be teasing Beatrice. 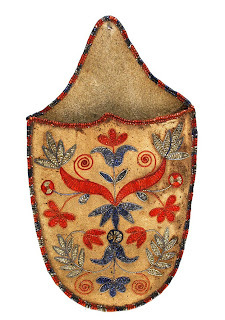 As her father’s new wife drives a wedge between Beatrice and her Papa, she can only be sure of the comfort of her beloved Cree grandmother, relegated to a room upstairs. It will soon be Christmas in both households, but how can either family be happy and celebrate when there seems so little to celebrate? Like Cass, who is wondering if there is any hope for a happy future in Old Maples, dark winter shadows hover around Beatrice, who feels trapped by her circumstances and the growing prejudice against those of mixed Cree and Scottish blood like herself. As she explores her visions and her unfulfilled life through her journal, she is suddenly confronted by a fateful choice: Should she settle for a straight-laced minister of the church – a man she doesn’t love, or remain an unhappy spinster? Is there any hope for happiness in the village of St. Cuthbert’s? When Cass finds Beatrice’s journal, the two young women begin a journey of healing and change in their lives. My research for the settings for Winter Shadows took me to rural Manitoba and St. Andrew's, a parish on the Red River in Manitoba, which still has some of the old stone houses from around 1850. The exterior of Cass's house in the novel, Old Maples, is fashioned after that of Captain Kennedy's house along the Red River (now a tea house and museum) and some of the interior comes from a typical small whitewashed Red River squared-logged house; the sort where the farmers and former servants of the Hudson's Bay Company lived; and also from the Governor's House at Lower Fort Garry, a few miles away - as Beatrice's father had once been a man of rank in the Hudson's Bay Company. The next two photos are also part of the old kitchen at the Governor's House, c 1850. Although it's not exactly the same as my other main character Beatrice's kitchen in 1856, it's pretty close. Her home kitchen at Old Maples is a bit larger, as it would be the centre of family life unlike the Governor's house. You can see the smoke hanging in the air. In Beatrice's kitchen there is also a large wooden table to work and to eat at and six wooden chairs - and her step-mother Ivy's locked store cupboard! A similar table is seen below. Cass and Beatrice share the same house - over 150 years apart. Both are unhappy young women, each facing a difficult new stepmother as well as other big changes in their lives. 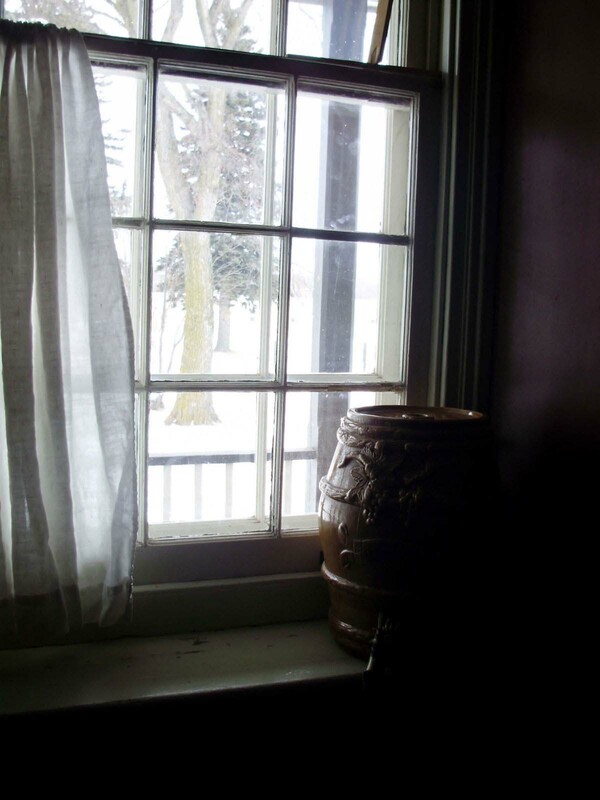 They often look out the windows of the old house to the river and trees beyond. Are they really seeing each other through time? I'm not sure what this little sleigh, above is, except probably a "play" sleigh for a child or a form of high chair. But it has a very Christmas-y look to it! A Red River farm house - similar to the one Duncan Kilgour lives in. EXCERPTS FROM SOME MEDIA REVIEWS: to give you more idea of the story through reviewers eyes! The female protagonists ....at the brink of independent adulthood ... are aware that they have to think seriously about the consequences of their decisions. ... Beatrice, and Cassandra have extra challenges because of their dysfunctional families, and they feel isolated from their contemporaries who appear to come from more stable and conventional ones. Their fathers’ inability to emotionally support or protect them is the catalyst towards change in their lives. Margaret Buffie’s Winter Shadows tells the intertwined stories of two Manitoba girls who are separated by time but united by parallel situations. Their timelines intersect at similar moments in their lives when they are trying to adjust to reconfigurations of their families, brought about by the remarriage of their fathers. The strained relationships with their stepmothers and stepsiblings form the bulk of the crises in the novels, and at moments of particular emotional distress, the girls have visions of each other that give them strength and encouragement; the past and future influence each other for the better. The modern Cassandra is worried she is losing her mind and seeing ghosts, but Beatrice, who lives in the nineteenth century (and is later revealed as Cassandra’s ancestor), is closer to her First Nations roots and more open-minded about visions. Although the wicked stepmother paradigm seems to be followed initially, the novels move towards better comprehension of the stepmothers’ characters, not surprisingly misinterpreted by the teenagers at the beginning. The novel’s hopeful ending comes from more effective communication and greater understanding of others’ positions, an understanding that leaves the protagonists with an improved, if not an ideal relationship with the stepfamily....Cassandra and Beatrice are sympathetic protagonists whose stories of eventual personal empowerment are thought-provoking. The well-told narrative and the argument that critical thinking leads to compassion and just action towards others make ... attractive choice for young adults. suspense and energy to sustain the two alternating narratives." The past setting of this novel is simply stunning. Buffie immerses the reader in the cold, the food (and the effort it took to find and prepare it), the influence of the church, and above all, the intermingling of the Scottish and native and English cultures in the settlement near Selkirk, MB. She is clearly sympathetic to the native/Metis wisdom and connection with the land, using many Cree words (that are both easily understood in context and explained in a glossary).....Buffie is a master of the ghost story, carefully allowing Cass and Beatrice to drift in and out of each other's lives in convincing fashion. The convention of the diary allows Cass to connect the dots and learn more about her ancestors. The dialogue both in past and present is authentic, revealing character and moving the action along. ....The 1856 setting is particularly effective and engaging. You feel the cold, you watch the preparation of a feast, you learn about the society and its expectations, and you become engaged in the lively character of Duncan Kilgour and his odd courting. The culture, the time, the expectations of that time, is all brought vividly alive. Beatrice and Cass interact, sense each other, and affect each other in a thoroughly convincing way in this engaging novel." Buffie’s characters and the conflicts they face are deeply engaging...Of special interest is the rare portrait of a multiracial community when informal marriages among British and First Nations people were common. "It was an enjoyable read, well written with wonderful characters, a great setting, and an interesting plot to which many can relate. It was a little like a contemporary Cinderella meets Jane Eyre, with a pinch of Mr. Darcy." Mimosa Effect. 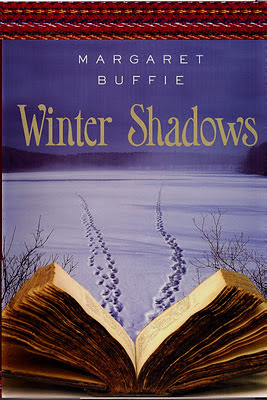 Margaret Buffie's tenth novel, Winter Shadows, is a beautifully crafted, richly detailed 'supernatural suspense' story. The author's fascination with the supernatural began at a young age. "My interest in the supernatural came about after my dad died. I was twelve at the time. I suddenly became very interested in books about life after death. I began going to the library and taking out books from the non-fiction section about this topic, from spirituality of the late 1800s, to biographies of real-life ghost busters, to ordinary people who had had extraordinary supernatural experiences." In Winter Shadows two young women, Beatrice and Cass, share separate but connected realities and an ancestry dating back to Manitoba's early settler days. Beatrice and Cass occupy the same house, Old Maples on the banks of the Red River, but not the same century. The story opens with Beatrice, who is English-Métis, her dead mother is English and her father is Cree First Nation (Cree words are used throughout the narrative, which includes a glossary of Cree terms at the back of the book). It is the winter of 1856 and Beatrice is dashing through the snow in her horse-led sleigh. Suddenly, through the flying snow she sees a ghostly apparition. Tupper, the horse, also senses something amiss. "As the conveyance passed a girl with a halo of red hair stared down at Beatrice through one of the windows." The conveyance is, of course, a car and the girl, Cass, and the "'strange device" vanish from view into the blowing snow. In a few short paragraphs, Buffie has set the scene and given the reader a palpable image of place, a snowy December in Manitoba. The chapters alternate between the two characters and span the winter months leading up to Christmas. Beatrice begins writing a diary on December 8 and the diary becomes the means through which Cass learns about Beatrice's life and begins to reflect on her own. Cass's step-mom (the source of her anger) is renovating Cass's childhood home, abolishing anything in the house that belonged to Cass's mother. In the original fireplace, Cass finds a broach, belonging to Beatrice and thus begins her glimpses into this other world, a look back into the history of her family and Old Maples. Beatrice and Cass are both strong-willed characters, struggling to find happiness in new circumstances. As the story builds, the girls become more aware of each other and their ability not only to be seen but also to influence the other. As the two stories become interwoven, they play off of one another in amazing ways. Will Beatrice marry the minister, a man she doesn't love but who offers a way out of the stifling environs of her home? Or will she follow her heart and realize that she loves Duncan? Will Cass come to terms with her new life? Winter shadows hang heavy on the hearts of both characters. Margaret Buffie has used the ghost story "as a way of examining the self coming to terms with the self," as Margaret Atwood describes it. Beatrice and Cass are transformed through their 'encounters' with one another. This book, so rich with fascinating historical detail and fully realized characters who seem to live outside its pages, is a must-read. "I'm 12 years old and i just finished reading your book called Winter Shadows and I have to say, I loved it! It's probably something you hear all the time...but anyway, I loved the way you sculpted the book, I loved the way you showed Beatrice's cluelessness to her love towards Duncan, it was so sweet but, i didn't like Robert he's to uptight, no fun, my idea of fun is kinda weird but, it's fun for me to curl under the covers with a good book and the fireplace crackling, hearing the soft rain touching my window......well anyhow I nearly cried when Cass was always fighting with Jean and never forgiving herself for not being there when her Mother died, it's, like this weird feeling inside me, very few books can do that to me. 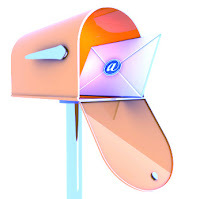 I'm sort of a writer myself but my books aren't really all the spectacular.....i do hope you read this email, even if you skimmed, thanks for listening! A Follow-up from Khushi - I love this, too! Sorry about replying so late!!! And yes my mom did say yes about putting my email on your blog. I also showed it to my librarian who is incidentally, one of my friends, she was the one who told me about your book, Winter Shadows, and now she's ordering me to return the book to the library so she can read it, and I'm flat out refusing. I just can't stop reading your book!! Till now I've read it at least 6 times, and am on the 7th time currently. She also told me about her daughter who did the same spontaneous act as I did, writing to an author. The author replied back, which was completely unexpected and turns out the author lived on her street!!!! It was completely ironic, and completely amazing. P.S. Thanks for replying to that first email, it really made my day! And I wrote back to this amazing young woman! A beautiful,well written story to be enjoyed by all ages,not just young people.Destined to be a Canadian classic, love the intertwining of modern life and that of Manitoba circa 1800's. I can see this as a Christmas movie joining the ranks of "A Child's Christmas in Wales". Denise, thank you so much for your generous and thoughtful comments. This book was one of the most interesting for me to research and write. I fell in love with the place, the time and my characters. I would love to see a Christmas movie made of it. Fingers crossed! Margaret, as a 50-something who has been learning about my own Metis family that was living in that area of Manitoba in the 1850's, thank you so much for this wonderful story! It's very well-written, makes excellent comparisons between the young women involved, and it really helped me understand what life was like for my own ancestors in the 1850s. Snow rose...this comment from you means lot to me. Thank you so much for taking the time to write to me. I loved every second of the research and the writing of the story. I am so glad that it resonated with you as a member of a Metis family.